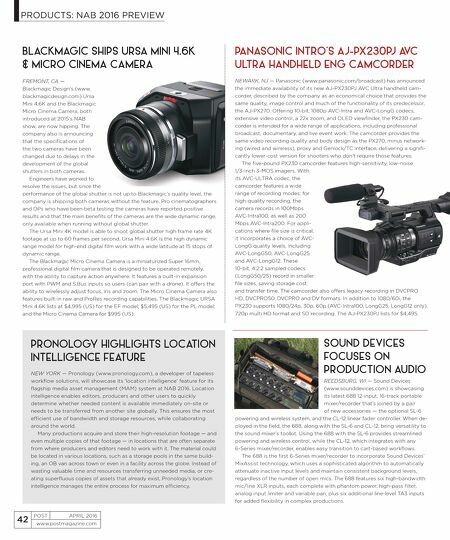 PRODUCTS: NAB 2016 PREVIEW www.postmagazine.com 42 POST APRIL 2016 PANASONIC INTRO'S AJ-PX230PJ AVC ULTRA HANDHELD ENG CAMCORDER NEWARK, NJ — Panasonic (www.panasonic.com/broadcast) has announced the immediate availability of its new AJ-PX230PJ AVC Ultra handheld cam- corder, described by the company as an economical choice that provides the same quality, image control and much of the functionality of its predecessor, the AJ-PX270. Offering 10-bit, 1080p AVC-Intra and AVC-LongG codecs, extensive video control, a 22x zoom, and OLED viewfinder, the PX230 cam- corder is intended for a wide range of applications, including professional broadcast, documentary, and live event work. The camcorder provides the same video recording quality and body design as the PX270, minus network- ing (wired and wireless), proxy and Genlock/TC interface, delivering a signifi- cantly lower-cost version for shooters who don't require those features. The five-pound PX230 camcorder features high-sensitivity, low-noise 1/3-inch 3-MOS imagers. With its AVC-ULTRA codec, the camcorder features a wide range of recording modes: for high-quality recording, the camera records in 100Mbps AVC-Intra100, as well as 200 Mbps AVC-Intra200. For appli- cations where file size is critical, it incorporates a choice of AVC- LongG quality levels, including AVC-LongG50, AVC-LongG25 and AVC-LongG12. These 10-bit, 4:2:2 sampled codecs (LongG50/25) record in smaller file sizes, saving storage cost and transfer time. The camcorder also offers legacy recording in DVCPRO HD, DVCPRO50, DVCPRO and DV formats. In addition to 1080/60i, the PX230 supports 1080/24p, 30p, 60p (AVC-Intra100, LongG25, LongG12 only), 720p multi HD format and SD recording. The AJ-PX230PJ lists for $4,495. PRONOLOGY HIGHLIGHTS LOCATION INTELLIGENCE FEATURE NEW YORK — Pronology (www.pronology.com), a developer of tapeless workflow solutions, will showcase its 'location intelligence' feature for its flagship media asset management (MAM) system at NAB 2016. Location intelligence enables editors, producers and other users to quickly determine whether needed content is available immediately on-site or needs to be transferred from another site globally. This ensures the most efficient use of bandwidth and storage resources, while collaborating around the world. Many productions acquire and store their high-resolution footage — and even multiple copies of that footage — in locations that are often separate from where producers and editors need to work with it. The material could be located in various locations, such as a storage pools in the same build- ing, an OB van across town or even in a facility across the globe. Instead of wasting valuable time and resources transferring unneeded media, or cre- ating superfluous copies of assets that already exist, Pronology's location intelligence manages the entire process for maximum efficiency. BLACKMAGIC SHIPS URSA MINI 4.6K & MICRO CINEMA CAMERA FREMONT, CA — Blackmagic Design's (www. blackmagicdesign.com) Ursa Mini 4.6K and the Blackmagic Micro Cinema Camera, both introduced at 2015's NAB show, are now hipping. The company also is announcing that the specifications of the two cameras have been changed due to delays in the development of the global shutters in both cameras. Engineers have worked to resolve the issues, but since the performance of the global shutter is not up to Blackmagic's quality level, the company is shipping both cameras without the feature. Pro cinematographers and DPs who have been beta testing the cameras have reported positive results and that the main benefits of the cameras are the wide dynamic range, only available when running without global shutter. The Ursa Mini 4K model is able to shoot global shutter high frame rate 4K footage at up to 60 frames per second. Ursa Mini 4.6K is the high dynamic range model for high-end digital film work with a wide latitude at 15 stops of dynamic range. The Blackmagic Micro Cinema Camera is a miniaturized Super 16mm, professional digital film camera that is designed to be operated remotely, with the ability to capture action anywhere. It features a built-in expansion port with PWM and S.Bus inputs so users (can pair with a drone). It offers the ability to wirelessly adjust focus, iris and zoom. The Micro Cinema Camera also features built-in raw and ProRes recording capabilities. The Blackmagic URSA Mini 4.6K lists at $4,995 (US) for the EF model; $5,495 (US) for the PL model; and the Micro Cinema Camera for $995 (US). SOUND DEVICES FOCUSES ON PRODUCTION AUDIO REEDSBURG, WI — Sound Devices (www.sounddevices.com) is showcasing its latest 688 12-input, 16-track portable mixer/recorder that's joined by a pair of new accessories — the optional SL-6 powering and wireless system, and the CL-12 linear fader controller. When de- ployed in the field, the 688, along with the SL-6 and CL-12, bring versatility to the sound mixer's toolkit. Using the 688 with the SL-6 provides streamlined powering and wireless control, while the CL-12, which integrates with any 6-Series mixer/recorder, enables easy transition to cart-based workflows. 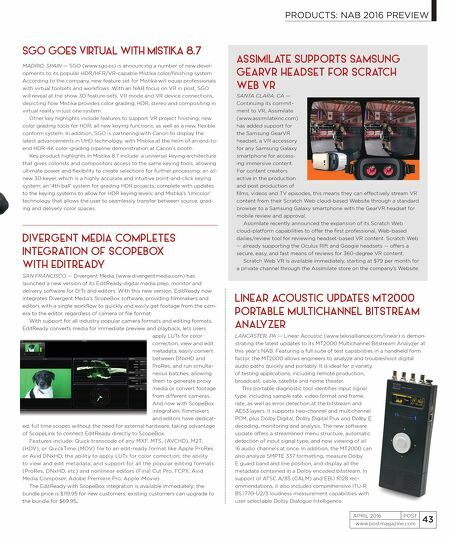 The 688 is the first 6-Series mixer/recorder to incorporate Sound Devices' MixAssist technology, which uses a sophisticated algorithm to automatically attenuate inactive input levels and maintain consistent background levels, regardless of the number of open mics. The 688 features six high-bandwidth mic/line XLR inputs, each complete with phantom power, high-pass filter, analog input limiter and variable pan, plus six additional line-level TA3 inputs for added flexibility in complex productions.